China's exports to markets along the Belt and Road Initiative, including Russia, Malaysia and India, surged in January, indicating that their ongoing industrialization and infrastructure development continued to stimulate economic exchanges with China, experts said on Wednesday. Exports to the three countries grew 39.1 percent, 22.8 percent and 18.1 percent, respectively, on a year-on-year basis, according to the Ministry of Commerce. Zhang Yunling, director of the academic division of international studies at the Chinese Academy of Social Sciences, said from a global perspective, upgraded consumption, manufacturing capacity and infrastructure cooperation have become the biggest highlights of projects related to the trading route initiative. Cai Weici, a senior adviser at the China Machinery Industry Federation, said: "The countries, mostly emerging economies, have growing demand for Chinese products, in particular construction machinery, building materials, passenger vehicles, consumer goods, and industrial and energy equipment." Exports to the European Union climbed 13.6 percent in January. Exports to the United States and Japan rose 17.2 and 18 percent, respectively. 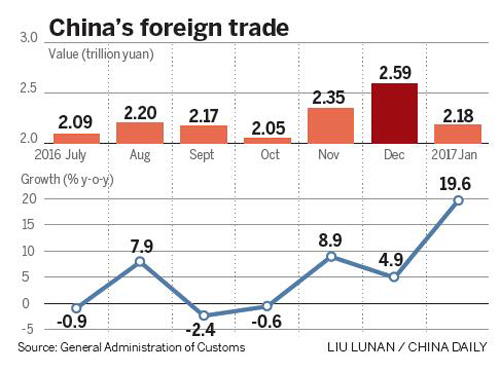 China's foreign trade rose 19.6 percent year-on-year to 2.18 trillion yuan ($317.5 billion) in January. Wang Dongtang, deputy director-general of the Ministry of Commerce's department of foreign trade, said: "Uncertain and unstable factors are increasing. 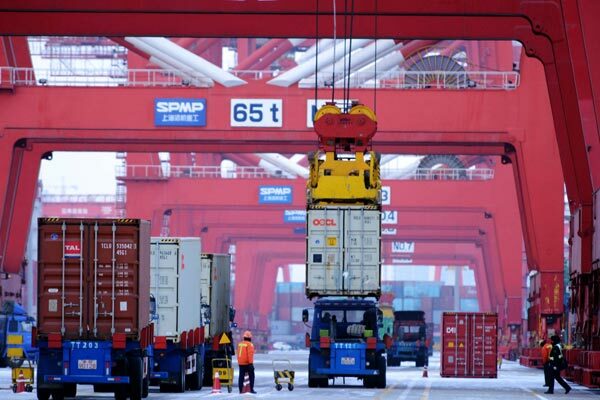 Difficulties facing China's foreign trade are not short term." The rise of trade protectionism and sluggish overseas demand are potential curbs on China's future export growth, he added. However, Wang said, China's foreign trade fundamentals have not changed and the country still retains advantages in this regard. Cheng Yu contributed to this story.